Charlie St. George pub established in 1883 is one of the oldest and most famous pubs in Limerick. Ideally located on Parnell Street as part of the Parnell Plaza Entertainment Venue it is directly across from Limerick Colbert Rail and Bus Terminus. Nearby there are many of Limerick’s landmarks including Tait’s Clock on Baker Place, the People’s Park, Limerick City Gallery of Art and Pery Square. Famous characters that have passed through the doors of Charlie St George and enjoyed a refreshment include Richard Harris, Russell Crowe, and so many of our rugby greats. PROVIDING LIVE PREMIER LEAGUE GAMES, RUGBY AND HORSE RACING WITH VARIOUS OTHER LOCAL SPORTS. Charlie St. George is a popular haunt for thirsty tourists and friendly locals alike. 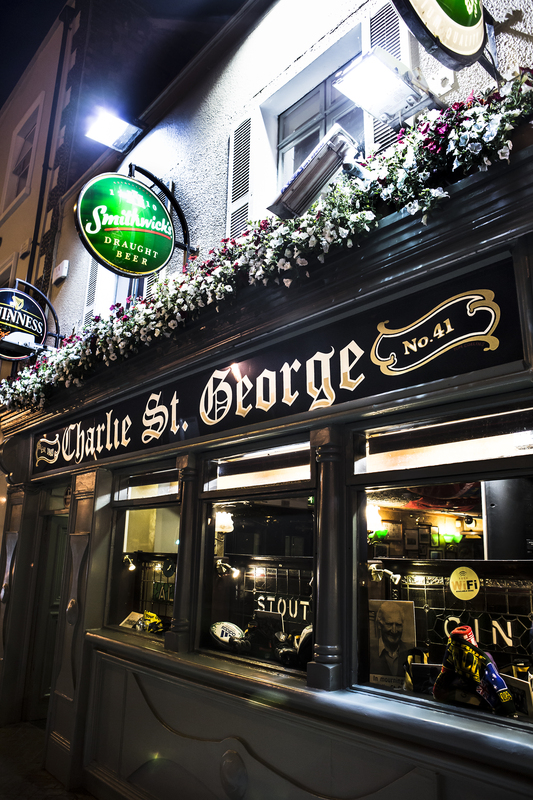 Charlie St. George’s location and sporting heritage makes it the perfect location to enjoy a drink, watch live sport and soak up the traditional Irish atmospheric culture. Fresh sandwiches and lunch specials are served daily. We also cater for parties and group bookings!